I got my Nakaya Decapod more than four years ago. I longed for it a long while before buying it, but when I got it I felt…disappointment. It felt too large, too black and not what I thought it would be and the nib felt scratchy. I sulked, put it away and tried to not think more about it. Once in a while I thought of selling it, but never got around to it. I wished I could love it, since Nakayas are supposed to create instant love. I didn’t. Around a year ago I decided to give it one more chance before letting go of it, put in one of the cartridges it came with and put it in my daily pen case. I used it in my work for daily jotting and notes as a mere tool with no real expectations. 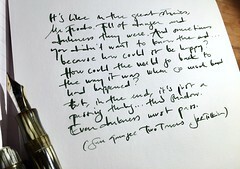 After a while the EF nib became less toothy. After a longer while it became one out of two favourites for quick notes. After even more time the black wasn’t as compact as when I got it, brand new in it’s packaging. And now we’ve become good friends. It is light weight and nice to hold and the material feels nice and warm in my hand and I like how use makes it nicer and better. This is a user pen – not a trophy pen – and I like the fact that it gets nicer and friendlier the more I use it.I’m not sure the Nakaya has become what I wanted, but it has definitely become a good pen in another way than originally planned. A good side effect of the slow start with this pen is that I haven’t bought any new pens for a few years, save one very cheap Parker Vector that I bought out of curiosity. This slowing down of my own desire to own more pens and work with the pens I have has been wholesome. Not buying pens has not affected my writing – on the contrary: I focus more on the writing and it has been relaxing to just look at pens without needing to buy them. This entry was posted in nakaya, pens, photo, reviews, writing and tagged fountainpen, nakaya, pens, review, reviews, writing. Bookmark the permalink.